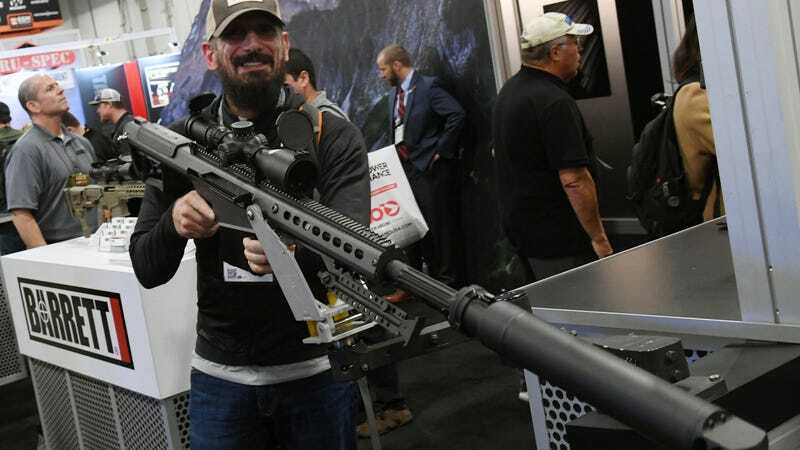 Eros Adragna of Texas looks at a .50-caliber semi-automatic Browning Machine Gun at the Barrett booth at the 2018 National Shooting Sports Foundation’s Shooting, Hunting, Outdoor Trade Show at the Sands Expo and Convention Center on Jan. 23, 2018 ,in Las Vegas. I am a proud black man. I am an unapologetic black man. To be black in America is to be an apology. To be a black man is to learn how to make yourself small at an early age. It is to constantly crumple yourself up into something ... anything smaller and less threatening. It is to bridle your tongue and stifle your intelligence. Any black man who says he has never done it is a liar. But most of all, to be black in America is to embrace acceptance. Acceptance of the fact that—even when you are home—you are never home. There is no such thing as home for you. There is no such thing as safety for you. Even when you are home, you are not safe. Or free. Or anything. Just black. Today, The Atlantic published an article by conservative writer David French about the culture of gun ownership. It is a thoughtful piece on how he first came to experience being a gun owner (when a man who seems to be a stalker showed up at French’s house and the school that French’s children attended). The part where people die. In fact, if every gun proposal being argued about right now passed tomorrow, David French could build a time machine, buy some Apple stock for me (I mean ... he’s already going, right? ), go back to the moment he decided to purchase a firearm and do it all again. French didn’t buy an assault weapon. He’s over 21. He’s not mentally disturbed. He doesn’t mention anything about owning an extended clip or a bump stock. And after all, isn’t that essentially what privilege is and always has been? On the great American balance scale, even the feelings of white men are worth more than the lives of anyone else. David French deserves to feel safe. David French deserves his security. Don’t mess with his culture. You couldn’t even understand. Even if it kills someone else. For every 1 self-defense killing there are 34 homicides. And the ironic part is that I, too, am a gun owner. I also believe in the Second Amendment. Like French, I want to protect myself and my family. But unlike French, I am not willing to do so at the expense of the lives of others. I often wonder what it’s like to feel that safe. To believe that you have a right—not just to be safe—but to feel safe. To be cradled by the world as it stomps on the skull of anyone who opposes you. To feel at home. To not have to live in the constant duality of being perceived as a threat and always being threatened. To not have to instinctively calculate a slower walking cadence when you encounter white women in dark parking lots so they won’t feel as if you’re following them. To not feel the “tha-dump” in your heartbeat when you see flashing lights in the rearview mirror as a cop follows you—even when you’ve done nothing wrong. To not be folded. To not be crumpled. To be straight. To be the danger but never safe. Never home. ... Never feeling like that must be the ultimate privilege.